Typically, articles that help you find the best times to visit Disneyland or Disney World come in two forms. The first provides some general guidance with details and explanations, but don’t always spell out specific dates as being better or worse. The second type, is basically a crowd calendar where using some variables they aim to predict what crowd levels will be for each park on any given day. Personally, I like starting with the former to understand the processes, and then using the latter to truly map out my vacation. Below are my picks for the best date planning resources out there. 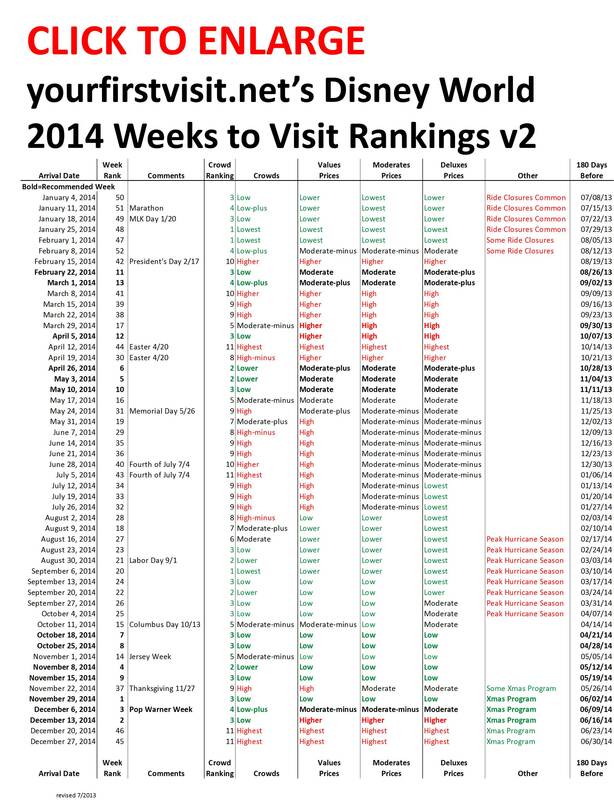 mickeyvisit.com gives a nice detailed overview of when to go and not to go. dadsguidetowdw.com has a good overview of good and bad weeks to visit. wdwprepschool.com has monthly dashboards that gives details for each month (and also has a crowd calendar below). dlrprepschool.com gives you 3 crowd codes (green for light, yellow for moderate, red for crazy) and lists holidays. isitpacked.com gives you 4 crowd codes (ghost town, hey it’s alright, yup it’s packed, forget about it) and also includes holidays as well. undercovertourist.com has a very detailed calendar that outlines a 1-10 crowd rating for every day and for every park at Disney World. yourfirstvisit.net gives some descriptions, too, then maps out which weeks are best to visit and factors in crowds, holidays, and prices. wdwprepschool.com gives you 3 crowd codes (green for light, yellow for moderate, red for crazy) and lists holidays and also has links to a dashboard for each month with much more detailed information.